Last autumn I read William Gibson’s The Peripheral, wherein one of the characters is a woman named Daedra West. She is described as a performance artist, but her oeuvre (French for “body of work”) is quite literally her tattooed body work: flayed tattooed skins. She is from the future, where and when they can remove and replace skin at the same time. Gibson has been frank in interviews over ***the years in saying that his understanding of science fiction is that it’s always an exaggeration of the present zeitgeist, so Daedra West and the future she inhabits is a bit of a satire of the contemporary. A couple of weeks ago I had a flash of insightful imagination, probably enabled by Gibson’s fiction. I imagined a scenario where I saw the contemporary artist Venessa Beecroft as a Gibsonian artist of the present condition, and could imagine Gibson writing a paragraph and describing 1% characters at an event, and offhandedly stating that a Vanessa Beecroft performance was underway. Vanessa Beecroft! And suddenly she was my favourite artist. Vanessa Beecroft! The name is a brand and in saying it we imagine naked woman standing about. She’s done this fifty-plus times now, since she titles her work in code and the one documented in the YouTube video below (uploaded June 2014) being VB55. In the video mentioned above, Beecroft talks about wanting to display attractive women as paintings, reflecting the fact that the historically maligned male gaze is also joined by a female gaze. The argument being Western art history is a product of the male gaze, and given that Western art history is also now widely reproduced, women are socialized to be looked at — something Berger’s Ways of Seeing explained fifty years ago. Part of me wants to say that there’s something instinctively human about an appreciation of a woman’s body — and point out a palaeolithic Venus figurine, and say this makes sense because we all come from women’s bodies and we were all nurtured by women in formative pre-conscious infancy. Of course whatever this instinct makes attractive about women’s bodies is now answered by a social culture wealthy in images of women, so that the male gaze is joined with a female gaze in a blasé social condition. Under this context, Beecroft displays women in natural nakedness, the female animal of this self-reflective species. It is completely objectifying and it’s supposed to be — living sculpture, women not necessarily on pedestals but readymade artflesh. Beecroft’s own experience as a woman jealous of other women, of being subject to the gaze and being the gazer, informs the performances, which are black-tie affairs. Through my own experience with art-events I know these are social occasions with pretentious air kissing amongst the wealthy who will never be my peers even if I were to become a very famous artist and very wealthy. Class difference is a result of another education and socialization, as alien to me as the extreme poverty at the other end of the spectrum. Which is to say the performers, who Beecroft has treated with respect, who Beecroft allows dignity while she dignifies them, whose humanity remains intact, become decoration for the rich. Is this not the perfect art for our decadent age? This is why Vanessa Beecroft is a sudden illumination. Vanessa Beecroft! Her career has passed from works of novelty into extreme relevance by these simple formulaic and predictable performances, the predictability allowing one to understand what is meant by “a Vanessa Beecroft performance”. Our consumerist age is one of brands, and Beecroft’s name is a brand. She objectifies women for black tie events and in so doing highlights the inequality of our time, how people are nothing more than decorative objects to an indifferent caste of super wealthy, who may see us and recognize our humanity but who do not interact with us. If a performance artist who sells framed sets of flayed tattooed skin is an synecdoche of the future of a century from now, can we indeed say (for argument) that she is a decedent of Kanye West and part of a creative thread that leads directly to Beecroft, she the artist of the present day who is a synecdoche of the Twenty Teens? 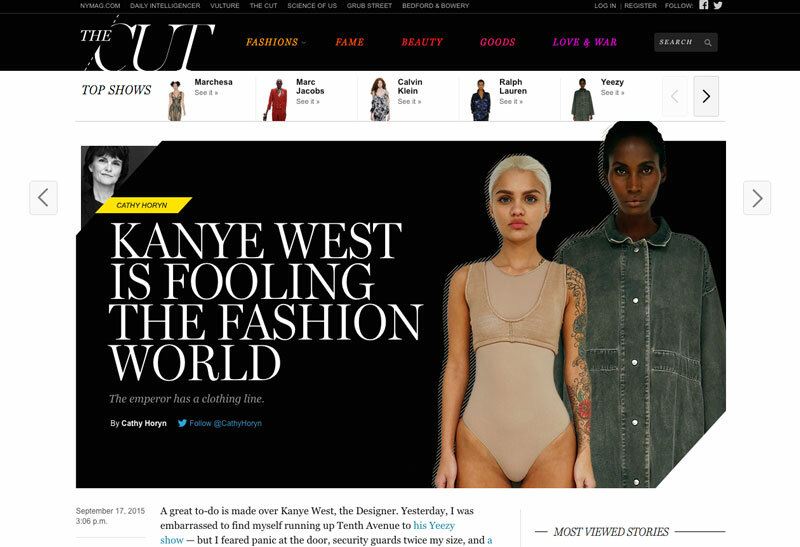 I am somebody that takes Kanye West seriously as an artist, so allow me to write about why I like his fashion shows. But first, I admit that I’m mostly indifferent to fashion and am both ill-informed and never expect to attend a Fashion Week of anything. I did watch the fashion television shows in the 1990s — Elsa Klench’s Style, Jeanne Beker’s FT & Tim Bank’s Fashion File, and while in art school was as entranced as everyone else by Alexander McQueen’s runway shows as glimpsed through them, especially his Autumn 1999 show, marrying Kubrick and Blade Runner on the eve of the millennium. (Looking it up on YouTube now, I’m still like fahwk). I write the following as a critic, as a commentator. 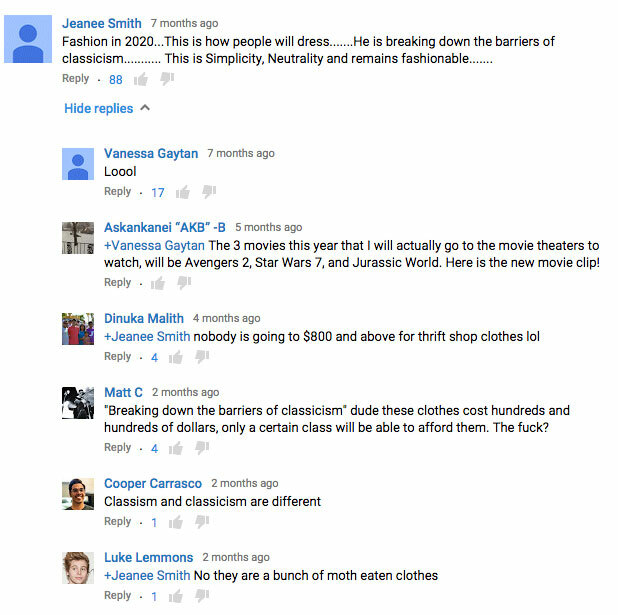 In seeing Kanye’s work via YouTube in the spring, what struck me about it was it’s modernity — a choice word. Kanye West is 38 and I am 40 — we were both children in the 1980s, subject to the pop culture which transitioned from Cold War Nuclear Existentialist Dread when were both small to a Capitalist Triumphalism when we were both teenagers. In between, television and movies were full of things the still echo today: movies about artificial intelligences, talking self driving cars, time travellers and aliens. The late 1980s and early 1990s saw a proliferation of post-apocalyptic dystopian future-set movies, from Robocop to Freejack. Back to the Future II, famously partially set in this year of 2015, stood out as being a film that didn’t depict the future (then 26 years away) as a dystopia. That 2015 California was not drought stricken; indeed when they arrive from 1985 it is raining. The years that followed have allowed me to see and understand that this future-casting, that this speculation was a Modernist cultural artifact. That Modernism as a cultural trend was concerned with the new, with the novel, with the idea of progress, and that this cultural arch spans the Futurists of a century ago through Flash Gordon serials and the 1939 World’s Fair to the Moon landings at which point the culture climaxed. The Seventies into which West & I were born was deflated, and so thinkers began to speak of being in a Post-Modern era. Nevertheless, the culture West & I were socialized in was thoroughly Modernist, from Star Trek re-runs to Knight Rider’s talking car. New and progressive and future oriented with The Year 2000 twenty, then ten, then five, then months away. Of course don’t imagine I’m speaking for West, I’m merely saying I get him because this is what I see in his work. I see an artist looking ahead, not behind. The Millennial Hippy evinces reproductions of a documented 20th Century: here is a flannel plaid 1950s bombshell maiden, and there a 1930s handlebar moustache lumberjack. The 20th Century socialized children to dream of the future; the 21st Century so far has socialized people to perceive and dream of the past’s authenticity. So last spring, faced with a worn out winter coat, and googling for a replacement, I was reminded that my pea coat was an artifact of the 18th Century — the wooden sailing ships for which it was suited have gone, but the coats remain on sale a two hundred plus years later. And this further was a reminder that men’s clothing — the business suit, the shoes, are themselves remnants of the 19th Century. The documentary effect of photographs and movies has created a lock on our imagination, and especially so over the last twenty years. The perceptible differences in the look of the decades evident in the 19th Century through to the 1990s seems to have vanished with the internet. So, in a culture still selling 19th Century clothing with a cannon of ‘timeless classics’ that have crippled imagination, West collaborates with Beecroft to march out an army of people wearing ‘contemporary’ clothes. The Modernist impulse to look ahead, to progress — to say, hey, while people are wearing leather soled shoes they are also wearing Nikes! And that suit going to his glass tower is being passed by someone in a hoodie! Our age does have it’s own thing, and its authenticity to our time is evident in the way we overlook it. So Yeezy’s Beecroftian “Season 1” and “Season 2” is people wearing sneakers and hoodies, and earth toned to our Neo-Medieval dystopia. He sees a beggar seated beneath a jeweller’s windows. […] The beggar has wrapped his legs and feet in brown paper tape, and the effect is startlingly medieval, as though someone has partially sculpted a knight from office materials. The trim calves, the tapered toes, an elegance calling out for ribbons. Above the tape, the man is a blur, a spastic scribble, his being abraded by concrete and misfortune. He has become the colour of pavement, his very race in question. So when I read Cathy Horyn’s dismissive review of this past week’s showing of Season 2, I was like no no. You so don’t get it lady. Ok, granted, this may not be “fashion”, but this is art theatre costume design for our corporate livestock and student indebted feudal dystopic condition. This is also an attempt to set aside the 19th Century costumes that continue to linger and to ask, does it not make more sense today to dress like this? Kanye West, rich in social and financial capital, can afford to ask it and take a risk with spandex. Again, I don’t know enough about fashion to be able to know whether the statement “he can’t be taken seriously as a designer” is something I should take seriously, but I think what he’s doing is genuine and authentic and one of the the most interesting things happening in art and culture today.